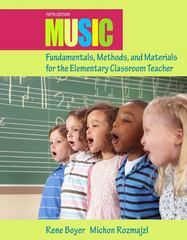 Music Fundamentals, Methods, and Materials for the Elementary Classroom Teacher 5 Edition Designed for prospective teachers without extensive music backgrounds, Music Fundaments, Methods and Materials for the Elementary Classroom Teacher, 5th Edition , provides both a thorough overview of the basic elements of music and a clear sequence of instructional steps that allows readers to participate in the same learning process they will later use as teachers. The text gives a proper overview to the basic elements of music, and a clear sequence of instructional steps in order to teach music to children in elementary school. This market-leading textbook can also be used as a major resource for elementary general music education specialists in the classroom.Packaged with an audio CD for use with the lessons, the text continues to be written in such a way that, once students leave the college classroom, they can easily use the text package as a resource handbook with their own students, without continued music specialist assistance and. Pre-service and practicing teachers will appreciate the range of content covered in this edition including: Teaching the elements of music to children (theory, rhythm, melody, timbre, expressive elements, form, texture, and harmony); Developing music skills (voice instruction, musical instruments, listening activities, and movement); and Organizing musical experiences (lesson planning, and integrating music with other subjects). Noteworthy enhancements made to the fifth edition include: expanded ideas on integrating music across the curriculum to enhance students’ knowledge of language arts, social studies, math and science; icons that represent curricular areas facilitate cross-curricular connections to music; references to the National Standards for Arts Education with direct applications to musical learning; inspirational accompaniment tracks for selected songs using children’s voices; multicultural and patriotic folk songs, rhymes and movement activities; activities on beginning drumming; new helpful guidelines on maintaining vocal health; and more tools and suggestions for the assessment of concepts learned.